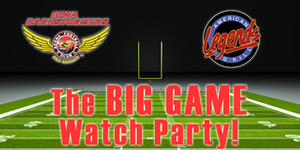 DES MOINES - The Iowa Barnstormers are pleased to announce the return of our big Game Watch Party! The Barnstormers have teamed up with Legends American Grill to host the ultimate viewing party. Join us on Sunday, February 2nd, at Legends in Johnston to watch the Denver Broncos take on the Seattle Seahawks. Members of the Barnstormers team, coaching staff, front office, and Storm Chasers dance team will be in attendance. The Iowa Barnstormers will also be holding a pre-game and half-time garage sale where we will be selling exclusive team items never before available to the public. Items will include team travel jackets and pants, free agent try out camp T-shirts, and hats. The event kicks off at 4:00pm. It's going to be a SUPER time! Legends is located at 8460 Birchwood Court in Johnston. The 2014 Barnstormers season is rapidly approaching. The Barnstormers hit the road for the first game of the season on March 15th against the Spokane Shock. Our home opener is scheduled for April 12th, 2014. Season tickets remain on sale now for as low as $110 per seat! For more information, call (515) 633-2255 or log on to www.theiowabarnstormers.com.